This week we're looking at before & after shots of some great window treatments in an Avon, NJ home! Have a look at the beautiful silhouettes in the bedroom, bathroom and living room, as well as the vertical Luminette shade on the sliding glass door in the bedroom. There are also some great looking wood blinds in another bedroom. Imagine the possibilities for your own home! Give us a call today (732-223-6662) to find out about these and all the great choices and prices we have on custom window treatments for your home, most available with motorization options! ASAP Blinds in Manasquan NJ has you covered for all of your window fashion needs in Monmouth & Ocean Counties and throughout New Jersey. Our knowledge and expertise will lead you to the right decisions for your home! Call us today at 732-223-6662 to see all the great window treatment options we offer! See your business in a new light! You know us for all of the work we do in homes in New Jersey, but we've also done work for a large number of businesses in the area, such as this restaurant/bar in Manasquan. The roller shades here provide great light-control and just the right amount of style to let the decor really pop! Give us a call (732-223-6662) to find out about all the great choices and pricing we have on custom window treatments for your business! To see individual photos, check out our Facebook Photo Album for this project! Roler shades in a Manasquan, NJ restaurant/bar. Roller shades in a Manasquan, NJ restaurant/bar. Detail of roller shades in a Manasquan, NJ restaurant/bar..
Roller shades are a popular choice for sliding glass doors (aka sliders). They're available in a variety of materials and transparencies, as well as with light-filtering and blackout options, so the perfect look can be found no matter what your style of decor is. The ones on this 4-panel sliding glass door are 3% opacity. One of many exciting recent developments in the world of automated window shades is the ability to control them with your voice, thanks to technologies such as Amazon's Alexa and the like. If you've got Alexa in your house, we're able to provide you with motorized window treatments that will behave according to your voice commands, for extra convenience and simplicity. As Central New Jersey's leader in automated and motorized window treatments - which are great not only for convenience or for hard-to-reach windows, but also very useful for folks with disabilities that may not be able to reach certain windows - we have the knowledge and expertise to set you up with the perfect window covering solution for your home. Check out some of the videos we've posted of remote-controlled shades and drapery! Our experience with years of service in the motorized window treatment industry guarantees you the knowledge you need to make the right decisions for window fashions in your home! ASAP Blinds in Manasquan NJ has you covered for all of your window fashion needs in Monmouth & Ocean Counties and throughout New Jersey. Call us today at 732-223-6662 to see all the great window treatment options we offer! In this waterfront home in Spring Lake, NJ we installed custom sheer roller screen shades in the large open living room, and more traditional roller shades on the sliding glass doors in some of the bedrooms. Roller shades are a great choice for nearly any room in your home. As you can see in the following video and the photos that follow, the sheer screen shades in the living room provide a great sense of the ocean outside while still providing privacy and light control. The shades on the sliding glass doors are a great choice for an often hard to shop for but popular window/door. Roller shades are available in lots of different fabrics, and are an easy window treatent to motorize for elegant automation. To see individual before & after photos, check out our Facebook Photo Album for this project! Roller screen shades in a Spring Lake, NJ living room. Roller shades in a Spring Lake, NJ bedroom. Roller shades in a Point Pleasant, NJ home. This home in Point Pleasant Borough has two sets of large sliding glass doors leading out from their family room and kitchen area to the backyard on the water. Roller shades are an excellent window treatment choice in these cases where a balance of privacy and view-through is desired, and these 138-inch rollers provide the perfect solution. Besides being easy on the eyes, roller shades offer many benefits. As mentioned above, the balance of light-control and privacy is a great feature, but they're also non-obtrusive and can blend in with nearly any decor. They're also available with different degrees of light-filtering options, including room-darkening and blackout. Give us a call at 732-223-6662 and let us help you find the perfect window fashions for your home! ASAP Blinds in Manasquan NJ has you covered for all of your window fashion needs in Monmouth & Ocean Counties and throughout New Jersey. Call us today at 732-223-6662 to find out about the other home window blinds and shade options we offer! Let's face it: nothing lasts forever, even your favorite window shades. Replacing your window treatments can be a great and simple way to add some change to the decor of your home, giving you a brand new feel and look, and at a fraction of the cost of remodeling! In the photo below, you'll see something slightly different in our before & after pictures: usually we show the bare window in our before shot, but this time we're showing you the previous window coverings, which were woven wood shades, to give you an idea of the new look attained by replacing the shades. The owners of this waterfront house in Brielle, NJ made a great choice in replacing their aging wovens with sheer roller shades, which give a much cleaner and stylish look, as well as providing better view-through out to the water. The ambient lighting is softer too, making for a whole new feel in the room! Plus, roller shades are a great candidate for automation, so just think of the possibilities these shades coupled with motorization can add to your own home! Woven wood shades (left) replaced by sheer roller shades (right). ASAP Blinds is the leader and expert when it comes to designing and installing traditional and automatic/motorized window treatments in your home. We serve homes up and down the Jersey Shore and throughout New Jersey, New York and Pennsylvania. Give us a call today at (732) 223-6662 to find out why! When it comes to window treatments, your options are nearly boundless. In this week's edition of JOB OF THE WEEK, we're going to take a look at before & after photos of roller shades in a kitchen, faux wood blinds in a dining room, and wood blinds in a living room...all in the same Brick, New Jersey home. To see individual before & after photos, check out our Facebook Photo Album for this project! The before picture of the kitchen shows temporary blinds on the window above the sink (this is an option we offer to our clients if they have no existing window coverings and need some sort of home blinds until our custom window treatments come in for them). Have a look at the roller shade above the sink in the after photo. It has a great subtle texture and sheerness that makes it perfect for this frequently used area of the kitchen: whether raised or lowered, you won't feel completely "trapped inside" when you're cooking or cleaning dishes, and it looks great too! Roller shades in a kitchen. As with the kitchen photo, the before picture of the dining room shows temporary blinds on the window. Faux wood blinds have a very similar look and feel to actual wood blinds, but at a much lower cost. The slats provide the same amount of privacy and light-control, and the mechanisms work in the same way. They also hold their own very well against heat and moisture, and are made without any harmful chemicals. Faux wood blinds are a great and cost-effective choice for this dining room. Faux wood blinds in a dining room. As with the previous photos, the before picture of the living room shows temporary blinds on the window. What can be said about wood blinds? They are one of the most classic and enduring of the hard window coverings. From natural looks to stained or painted ones, they provide a look that's at home in any room. In this living room, they remain unobtrusive, practical and stylish. Wood blinds in a living room. ASAP Blinds in Manasquan NJ has you covered for all of your window treatment needs in Monmouth & Ocean Counties and throughout New Jersey. Call us today at 732-223-6662 and find out about our large selection of blinds, shades and other window treatment options. This New Jersey home needed window treatments that wouldn't make them feel cut off from the outside world, yet still provided sufficient light control and privacy. Roller screen shades fit the bill perfectly! These window shades give you a sheer and elegant look while still providing the benefits you expect from home window coverings. Have a look at the video below to see before & after shots of these roller shades in a kitchen, a guest bathroom, a home office, a laundry room, and a master bathroom with a jacuzzi. ASAP Blinds in Manasquan NJ has you covered for all of your window fashion needs in Monmouth & Ocean Counties and throughout New Jersey. Call us today at 732-223-6662 to see the other roller shade options we offer and New Jersey's larget selection of window treatments! See your [bar] in a new light! Our latest edition of Job of the Week finds us installing some great looking motorized screen shades in the bar at The Mill Lakeside Manor in Spring Lake, NJ. These sleek shades are a great complement to the bar's stylish decor, and provide just the right amount of light filtering without spoiling the great view over the lake! To interact more with these before & after photos, check out our Facebook Photo Album for this project! ASAP Blinds in Manasquan NJ has you covered for all of your commercial and residential window treatment needs in Monmouth & Ocean Counties and beyond. Call us today at 732-223-6662 to find out more! 40% Off Sale on Cellular and Roller Shades through July 8, 2017! Independence Week 40% off Sale! Through July 8, 2017 we're offering 40% off Comfortex Cellular Shades (also known as Honeycomb Shades) and Roller Shades! As always, we custom measure & install everything we sell, so you're assured of not only a great deal but also a perfect fit for your home! First let's talk about cellular shades, then we'll discuss roller shades. Toward the end we'll see how these are both great choices not only for any window, but also for French doors and sliding glass doors. Cellular Shades are a soft window treatment generally made of a cloth-like material, available in many colors. The material is woven into cells that resemble honeycombs (hence the name), and the effect of this is not only a great-looking window shade, but one that can actually help with your utility bills as these cells trap air and can act as a barrier between your window and your room, providing some relief from unwanted temperature circulation. A cordless option is the most popular choice for cellular shades, and they are even available in top-down, bottom-up models which allow you to open the shade from either the top or the bottom, giving you great choices for light-control and privacy! Cellular shades in a family sun room (above). Room-darkening cellular shades in a bedoom (above). Roller Shades are one of your best choices for a clean, streamlined look for your windows. Simple yet elegant, they look great alone or when paired with another window treatment such as curtains. Roller shades come in varying degrees of opacity and colors, and are great for reducing glare and protecting your furniture from harmful UV rays, as well as keeping the sun and heat to a minimum. These modern & stylish window shades are available in cordless options, and are spectatcular when automated with a motorized window treatment system as seen in the video at the bottom of this article. Roller shades in a living room (above). Roller shades in a bedoom (above). Cellular shades for French doors, and roller shades for sliding glass doors are very popular options. Of course, either type of shade works well on either type of door, so neither of these great window coverings should be limited to only windows! Below are a few examples of these shades on both French and sliding glass doors. Below is a video of automated roller shades in a home by the beach. Notice how they still preserve the great view while cutting down on the glare and heat in the room. A very fine choice indeed! At ASAP Blinds, we offer a wide selection of window shades from some of the most respected brands in the business, and we custom measure & install on each window for the perfect fit and look. With our current 40% off sale on Comfortex roller and cellular shades running through July 8, 2017, there's no better time to get these versatile and stylish shades in your home. Call us at (732) 223-6662 today to see all the great options we have for shades in your home! This week we're taking a quick look at roller shades! As you can see from the before & after photos, these gorgeous shades provide just the right amount of light control to keep a sense of openness to your room. Great for rooms that have a view you enjoy, and they even work seamlessly on sliding glass doors as evidenced in the pictures. ASAP Blinds in Manasquan NJ has you covered for all of your window treatment needs in Monmouth & Ocean Counties and beyond. Call us today at 732-223-6662 to find out more! This week we're looking at before & after shots of roller shades. This home has two different kinds of roller shades: some with a deco bar instead of a valance, and some that are room-darkening. Enjoy! 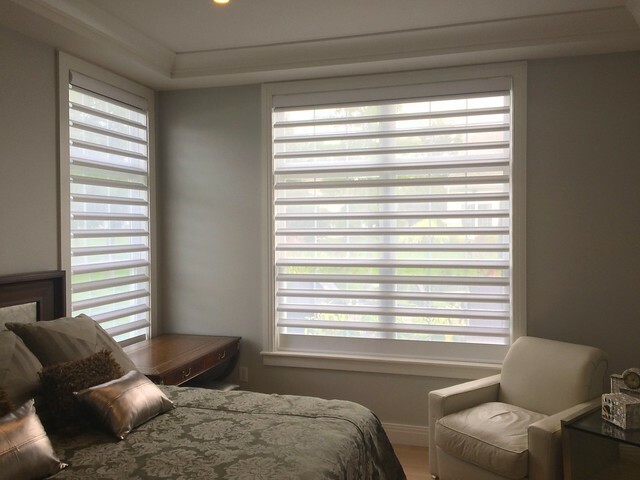 Check out this slideshow of before & after photos - and the motorization video in the middle - from a recent job where we installed motorized roller shades and white plantation shutters in this Jersey Shore home! Have a look at this video of motorized roller shades that we recently installed in a home. From the kitchen area to the family room, the window treatments efficiently and elegantly provide privacy and light control, making quite a good impression while still being practical! Here is a slideshow of before & after photos from a job we were pleased to work on that included white wood blinds in various rooms and roller shades on doors leading to the outside. This is an example of a homeowner calling us before being completely moved in, which we recommend when possible...particularly for motorization jobs. To see individual before & after photos, check out our Facebook Photo Album! See your office in a new light! Most people know about our commitment to making your home more beautiful with the right window treatments, but we also have many corporate clients! Here is a before photo & a few after photos of a job we were pleased to work on with roller screen shades in some frequently used common areas of the business. Here's a slideshow of photos from a recent project we were pleased to work on. Before & After shots of motorized roller shades in a dining room, living room, and home office, and motorized pirouette shades in a bedroom. See the roller shades in action!